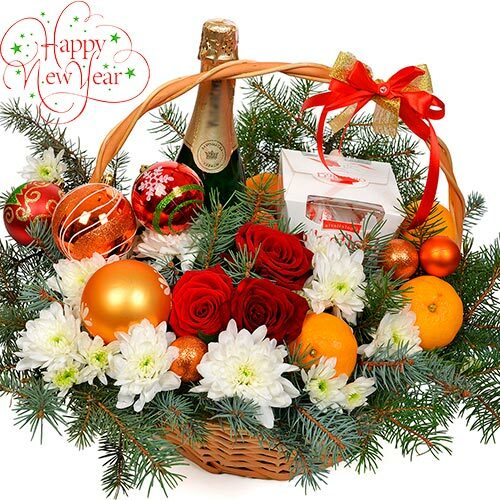 Bright and festive basket - will convey the most positive and joyful emotions to your recipient! Composition: 3 red roses, 2 branches of white chamomile, champagne Cricova, box of chocolates Raffaello, mandarins, Christmas decorations, basket, spruce branches, floral material. (The basket is delivered in a transparent cellophane package.) Fruit weight: 1 kg. When you order flower bouquet or composition, they will be produced as closely as possible to the picture. Please remember that each bouquet or basket is hand made. No two arrangements are exactly alike and color and/or variety substitutions of flowers and containers may be necessary. Some items may vary depending season and availability in certain regions.